Question - Define the term 'marketing planning'. Outline the steps involved in marketing planning process. 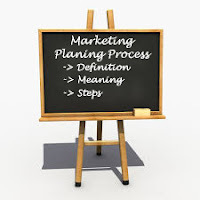 Marketing planning process is a series of stages that are usually followed in a sequence. Organisations can adapt their marketing plan to suit the circumstances and their requirements. Marketing planning process involves both the development of objectives and specifications for how to achieve the objectives. Following are the steps involved in a marketing plan. Mission is the reason for which an organisation exists. Mission statement is a straightforward statement that shows why an organisation is in business, provides basic guidelines for further planning, and establishes broad parameters for the future. Many of the useful mission statements motivates staff and customers. Objectives are the set of goals to be achieved within a specified period of time. Corporate objectives are most important goals the organisation as a whole wishes to achieve within a specified period of time, say one or five years. All the departments of an organisation including marketing department works in harmony to achieve the corporate objectives of the organisation. Marketing department must appreciate the corporate objectives and ensure its actions and decisions support the overall objectives of the organisation. Mission statement and corporate objectives are determined by the top level management (including Board of Directors) of the organisation. The rest of the steps of marketing planning process are performed by marketing department. All the actions and decisions of the marketing department must be directed to achieve organisation mission and its corporate objectives. Marketing audit helps in analysing and evaluating the marketing strategies, activities, problems, goals, and results. Marketing audit is done to check all the aspects of business directly related to marketing department. It is done not only at the beginning of the marketing planning process but, also at a series of points during the implementation of plan. The marketing audit clarifies opportunities and threats, so that required alterations can be done to the plan if necessary. The information gathered through the marketing audit process is used in development of SWOT Analysis. It is a look at organisation's marketing efforts, and its strengths, weaknesses, opportunities, and threats related to marketing functions. Strengths and Weaknesses are factors inside the organisation that can be controlled by the organisation. USP of a product can be the example of strength, whereas lack of innovation can be the example of weakness. Opportunities and Threats are factors outside the organisation which are beyond the direct control of an organisation. Festive season can be an example of opportunity to make maximum sales, whereas increasing FDI in a nation can be the example of threat to domestic players of that nation. A good marketing plan is based on deep customer understanding and knowledge, but it is not possible to know everything about the customer, so lot of different things are assumed about customer. Target Buyer Assumptions - assumptions about who the target buyers are. Messaging/Offering Assumptions - assumptions about what customers think are the most important features of product to be offered. After identification of opportunities and challenges, the next step is to develop marketing objectives that indicate the end state to achieve. Marketing objective reflects what an organisation can accomplish through marketing in the coming years. Objective identify the end point to achieve. Marketing strategies are formed to achieve the marketing objectives. Marketing strategies are formed to determine how to achieve those end points. Strategies are broad statements of activities to be performed to achieve those end points. Marketing managers have to forecast the expected results. They have to project the future numbers, characteristics, and trends in the target market. Without proper forecasting, the marketing plan could have unrealistic goals or fall short on what is promised to deliver. Forecasting Customer Response - Marketing managers have to forecast the response that the average customers will have to marketing efforts. Without some idea how the marketing will be received, managers can't accurately plan the promotions. Forecasting Marketing cost - To make the marketing plan stronger, accurate forecast of marketing cost is required to be done. Forecasting the Market - To accurately forecast the market, marketing managers have to gain an intimate understanding of customers, their buying behaviour, and tendencies. Forecasting the Competition - Forecast of competition like - what they market, how they market, what incentives they use in their marketing can help to counter what they are doing. A alternate marketing plan is created and kept ready to be implement at the place of primary marketing plan if the whole or some part of the primary marketing plan is dropped. The marketing budget is the process of documenting the expected costs of the proposed marketing plan. One common method to allocate marketing budgeting is based on a percentage of revenue. Other methods are - comparative, all you can afford, and task method. At this stage the marketing team is ready to actually start putting their plans into action. This may involve spending money on advertising, launching new products, interacting with potential new customers, opening new retail outlets etc. The marketing planning process is required to be evaluated and updated regular. Regular evaluation of marketing efforts helps in achieving marketing goals. We are working hard to make eNotesMBA more useful. Its very good for students and working people.